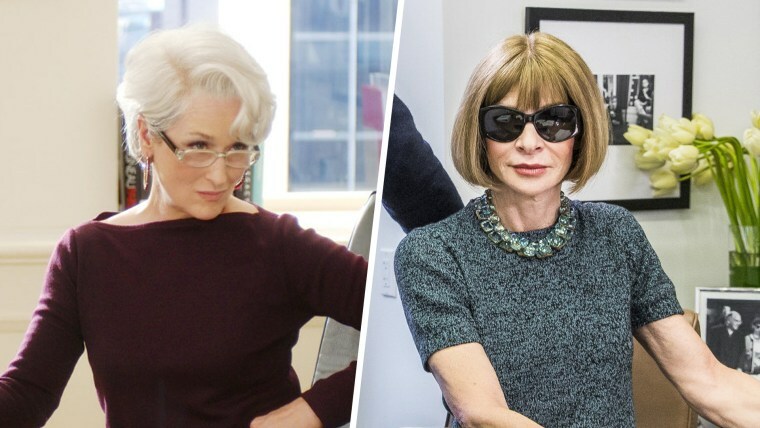 Rumor has long had it that Meryl Streep's "Devil Wears Prada" character — the elite and demanding fashion magazine editor Miranda Priestly — was based on Vogue's leading lady Anna Wintour. That's what makes a new video from Vogue so perfect. In it, Streep channels Priestly once again — this time for a face-to-face meeting with Wintour. While she doesn't don the character's clothes, the three-time Academy Award winning actress echoes some of her actions from the film on her way to Wintour. It's fun for fans, and it's the perfect lead-in for a chat to remember. After taking a familiar-looking elevator ride, Streep gently tossed her coat to Wintour's Andy Sachs-like assistant before taking a seat across from real no-nonsense editor. The interview that followed was just as interesting for what was said as what wasn't. "Obviously, you've played a lot of extraordinary women," Wintour told Streep, who happens to be the magazine's latest cover subject. "What was the most challenging woman you ever played?" "Oh! I should say...," Streep said, smiling and pointing across the desk before Wintour interrupted. "No. No, we're not going there, Meryl," she laughed. Given that Wintour was widely reported to dislike the 2006 dramedy when it was first released, it's a delightful exchange for fashion and film lovers. Also delightful? Despite all the obvious allusions to "The Devil Wears Prada," the movie is never name-checked in the five-minute-plus clip.